There are five different products in the collection, however Zoella's 'people' have old me there will be at least another addition, but that is all I know at the moment. The product I didn't get was the Zoella Fruits Rollerball Trio as this just isn't something I would use, I much prefer a fragrance spray. 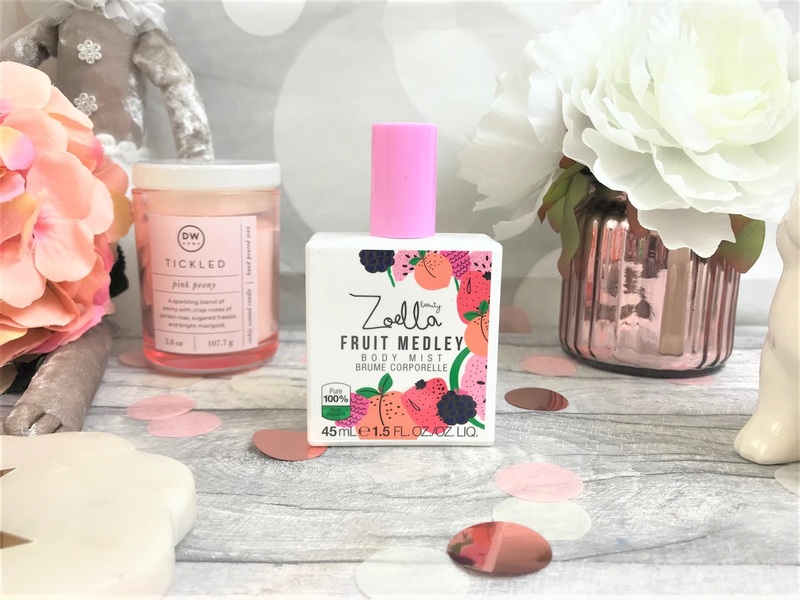 Therefore, we may as well start with the Zoella Beauty Fruit Medley Body Mist (£8.00), which comes in the same glass bottle packaging as previous Body Mists, and to me they always seem more like an eau de toilette than a body mist as the scent often lingers for a while. I am so glad this is a fruity range rather than a floral one, as many of her ranges have been more floral and sweet, whereas this range is a lot fresher. I must say I really like this fragrance, it reminds me of Summer and and is a totally wearable scent which makes me feel happy when I wear it. The first of the three body products available is the Zoella Beauty Berry Jam Body Scrub (£6.00) which has actually been infused with kiwi seeds and natural exfoliants, which isn't something you would ever really see in Zoe's previous scrubs. I expected this to be a little bit sickly, but it really isn't, it is fresh and you can smell the berries for sure. You can see through parts of the packaging and see those kiwi seeds in there which I think adds to the fruity vibe. It exfoliates really well and is a little creamy once you are massaging it into the skin, leaving the skin super smooth and smelling delicious. My favourite kind of body washes are the foam type as they are just so luxuriously soft and creamy on the skin and your skin always feels well-nourished afterwards, and so I was very excited to see the Zoella Beauty Banana Foam Body Wash (£6.00). 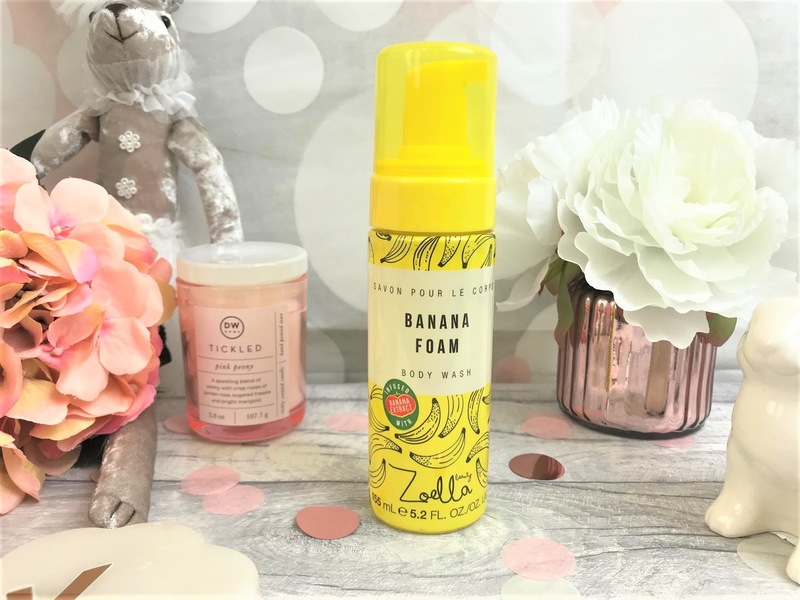 Not only because it was a foaming body wash, the first Zoella Beauty has done, but also because it was in my favourite fruity scent - banana! The packaging is great, no hint of cheap packaging here, and it smells like heaven. It is kinda making me mad that this is her best range yet, because it is her last, and I really have nothing negative to say about the collection. 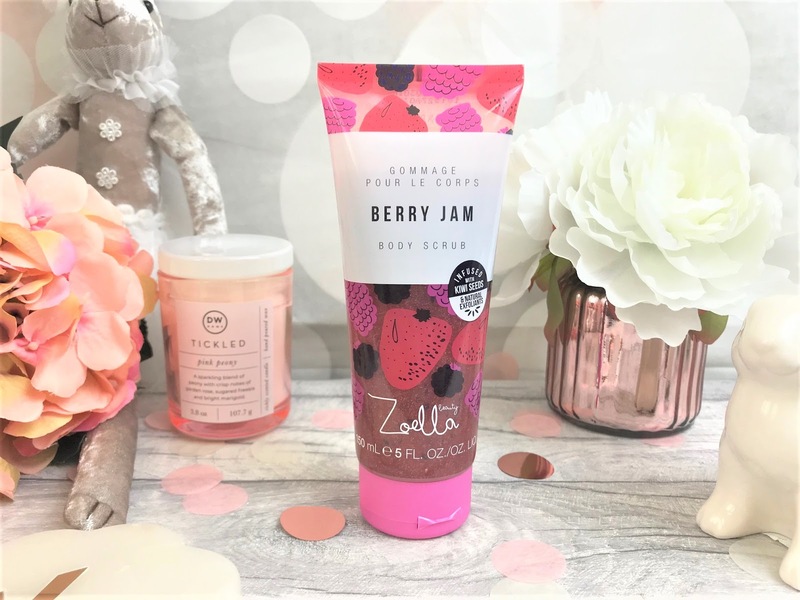 I am always very honest with my reviews, and Zoella Beauty have smashed this final collection - I just need to stock up now! 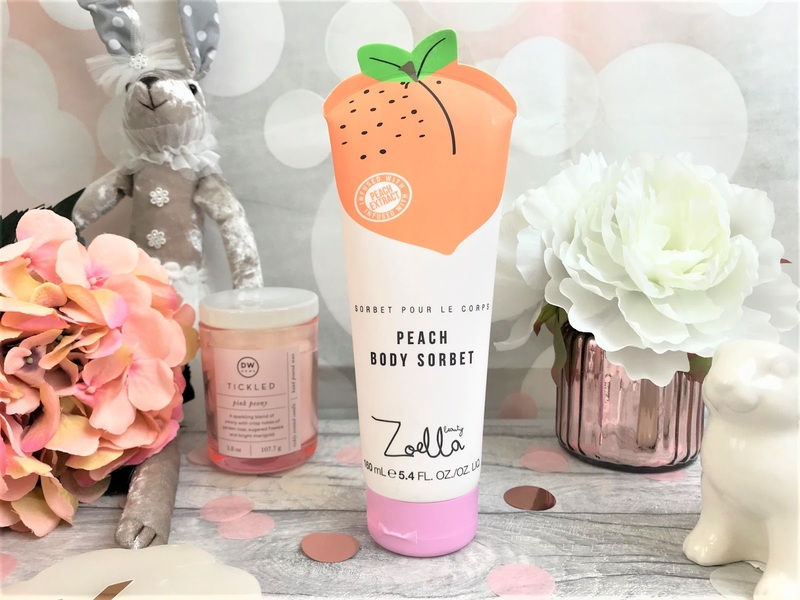 The final product in the final collection is the Zoella Beauty Peach Body Sorbet (£6.00). Oh my gosh, I was worried about this one because too much peach fragrance I can't handle, but this actually smells like real, fresh peaches, not the scent you get that smells like fake strong horrible peach. The packaging is cute, and I much prefer that this is more of a sorbet texture than a thick moisturiser, as I much prefer something fresh and light on my skin, yet this does do a great job of moisturising. I think this is going to be gorgeous in Summer time after a day in the sunshine. Zoella Beauty please come back! In all honesty, Zoe and her team have really smashed it with this collection, and if this is a hint of things to come, then I'm excited! Goodbye Zoella Beauty, hello Zoe Sugg! 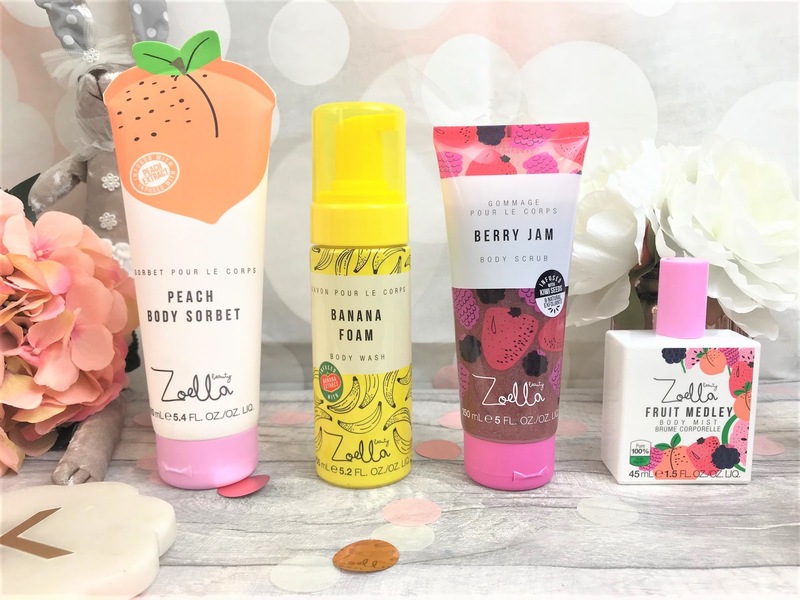 You can find the Zoella Beauty Fruits Collection in-store and online at Superdrug.